At The Links at Brunello, we dedicate ourselves and our facilities to providing our community members and customers with the finest experience in golf; concentrating on tradition, accessibility, entertainment and hospitality. Our focus is on exceeding the expectations of all guests with quality products and customer service that is second to none. The Links at Brunello will be a recognized leader in the golf industry, providing a high-quality experience by ensuring that our facilities and service exceed the expectations of our community members, our customers and our employees. To be considered one of the industry leading golf experiences is not a goal easily achieved. There are several factors necessary to provide this level of excellence. First and foremost is the need to provide a quality, forward thinking product; next, the product must be maintained and cared for at a superior level of consistency. We will be the golf club by which others set their standards. We are totally responsible as a team for the reputation and image presented to our community members and guests. We will treat every day as the one day on which the reputation of The Links at Brunello will be created and judged. The Links at Brunello philosophy is simple: Every service we provide will be the best of its kind. We are committed to being an employer of choice in the industry, creating a superior working environment with professional colleagues committed to service excellence. We search for employees that are motivated and enthusiastic with a gift for creating phenomenal experiences and lasting memories for our members, guests – employees that will leave a legacy. These positions require experience in a high paced work environment involving skills in a variety of areas, including guest service, handling tender, telephone and tee time systems, merchandising, retail sales and product knowledge of golf equipment. Your golfing ability is not vital. A great attitude, working knowledge and desire to learn and enjoy the game will benefit you, the team and our guests. Responsible for serving the golfing guest throughout the arrival, departure and on course experience. Responsible for servicing the golfing guest through the check in process and retail shopping environments. Responsible for supervision of campers and implementing a program of activities and instruction for junior academy camps. Responsible for providing a unique service experience fot our dining room, lounges, banquets, patios, snack bar and beverage cart. Responsible for performing specific techniques and practices that are required to uphold one of Canada’s top golf courses. Our membership expects a conservative yet modern grooming style. Professionalism in the way we speak, act and present ourselves in crucial to our success. We are Ambassadors of The Links at Brunello and our image is of utmost importance to the reputation of the company and in selling the stage for service excellence. The Links at Brunello provides equality of treatment and opportunity to all Colleagues and applicants. Decisions regarding employment will be based on the applicant’s possession of the essential skills, capability, knowledge and experience required to perform the job. AND IT ISN’T ALL WORK! Aside from the multitude of outdoor activities, there are many organized staff events and you can participate in such as an annual Staff Golf Tournament and Staff BBQs. Colleagues of The Links at Brunello are invited to attend any or all of our golf course socials. The Thomas McBroom signature has become synonymous with the design and construction of outstanding golf courses across North America and around the world. Twelve of his courses are ranked in Canada’s top 100 according to Score Magazine, second only to the legendary Stanley Thompson. The hallmark of a McBroom course is a design that is beautiful, fun to play and uniquely its own. Every Thomas McBroom design captures the unique characteristics of the landscape, so that each course possesses its own distinct personality, charm and playing experience. McBroom’s passion to create courses that stir the golfer’s soul is demonstrated proudly in every design that bears his signature. To see more of his designs, click here. You may also learn more about Thomas McBroom here in his brochure. At The Links at Brunello, we know the value of pets in our lives and what benefits they provide as extended members of our family’s. Data tells us that nearly half of detached residential homes have at least one pet and of those 75% - 85% are dogs. We are happy to say we are now more pet friendly focused, and that we cater to your four-legged friends. In fact, we are so pet friendly, our General Manager, Miles Mortensen brings his family’s golden retriever ”Jake” with him to work. Our outdoor patio at the golf course is also dog friendly, meaning you & your four-legged friend can extend your walk and come enjoy lunch and or the views or both. You dog must be on a leash and attached to one of our dog friendly hooks located on the patio. 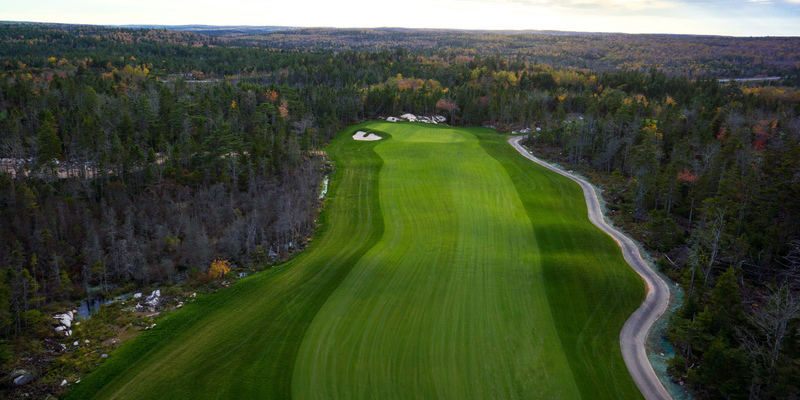 We’re proud to be one of the only golf courses in Atlantic Canada and the first course in the Halifax area to offer dog friendly tee times every Sunday after 4pm. There is no added cost for your four-legged friend to join you on the course and dog free times are always available for those who would prefer to play on their own. Dogs are required to be on leash at all times on the course as well as abide by our dog friendly tee times. Dogs must be on a leash at all times during the round of golf and are the SOLE responsibility of the owner. Whether you live here or you’re just here for a visit, you and your dog will enjoy our daily walks which are offered on the cart paths of the golf course itself in the non-golfing months which is typically mid-November to mid-March. In season while the golf course is open, you can branch off the choose to explore the walking trail has been developed along an abandoned rail line. The trail is called ” BLT RAILS TO TRAILS” and is a wonderful place to walk, ride a bike or ride your ATV. In season – you can enjoy the mile-long trail to the Boat Launch at Nine Mile River for your year-round dog walking. One of the things we’re most proud of is how clean our community is. To keep cleanliness top of mind, and if you haven’t brought your poop bags, we have ample supply in the golf shop and have garbage’s conveniently located at the clubhouse as well throughout the course for the on-course walking. Please cleanup after your pets to keep this benefit thriving. Contact Us What can we share with you? Yes, I would like to receive your latest news and VIP offers!